The existence of a housing crisis in England has been widely accepted for some time. Nowhere is this crisis more acute than in London, with its combination of rapid population growth and churn, high levels of deprivation, and significant constraints on providing additional accommodation. 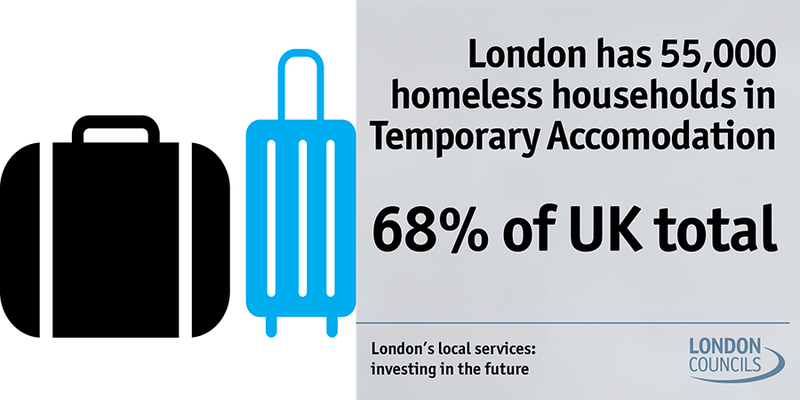 In 2017 London had 55,000 households in Temporary Accommodation (68 per cent of England total). This has risen by 19,000 (52 per cent) since 2010. London has 15,000 people classed as homeless and in priority need (27 per cent of the national total). The number has risen by 5,000 (52 per cent) since 2010. The underfunding of homelessness and Temporary Accommodation creates a cost shunt to the general fund of over £170 million a year.